All undergraduate students are required to maintain adequate health insurance coverage, while registered for classes at Saint Xavier University. If you have existing health insurance coverage, you must complete the WAIVER FORM. Students who do not complete the WAIVER FORM will automatically be enrolled in the Saint Xavier University Student Accident and Sickness Insurance Plan. 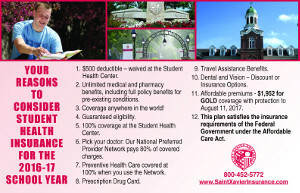 Premium for coverage under this Insurance Plan will be added to your tuition. To check status of an existing waiver click here. Please note: Existing Coverage will be verified. Please be sure to use the correct Student ID Number issued to you by the University when completing the Student Insurance Waiver Form. Participation in the Insurance Plan is voluntary. Call 800-452-5772 or use the offline enrollment form and pay premium by check or credit card. Your Customer Service Team at Associated Insurance Plans International, Inc. can be reached at 800-452-5772. AIP STUDENT INSURANCE IS NOT WORKING WITH SAINT XAVIER UNIVERSITY FOR THE 2017/2018 ACADEMIC YEAR. PLEASE CONTACT THE UNIVERSITY FOR WAIVER AND ENROLLMENT INFORMATION FOR THE 2017/2018 YEAR. In order to use your student insurance plan's pharmacy benefits you must use a participating pharmacy. Please find a participating pharmacy at www.OptumRx.com. With the change in policy year to 2016/17, your pertinent information must be provided to Optum RX and updated in their database. These procedures can take up to 10 days from the receipt of the name list from your school. If you are not recognized by your pharmacy it is because this update has not been completed. You may file a claim for a reimbursement using the claim form in the drop down menu to the left should you need to purchase medication prior to your pharmacy recognizing you in the Optum RX system. You will receive your Identification Card for the Pharmacy Drug Program approximately 2 weeks after the waiver deadline date for each semester. Until your permanent Identification Card is received, you must present the Temporary Identification Card (found by going to www.saintxavierinsurance.com.) to your Pharmacist. You may also call 800-452-5772 and ask that a copy of the Temporary Identification Card to be sent to you. Note: You may call AIP prior to using the Optum RX Temporary ID Card to verify your eligibility information has been provided by Optum RX. An emergency helpline for students in need of medical or legal help or advice, within or outside of the United States. Students may utilize the Nurse Advice Line anytime they need confidential medical advice. ON CALL provides clinical assessment, education and general health information. This service shall be performed by a registered Nurse Counselor to assist in identifying the appropriate level and source(s) of care (based on symptoms reported and/or health care questions asked). Nurses shall not diagnose ailments. This program gives access to the nurse information line 24-hours a day, 7 days a week. One phone call is all it takes to access a wealth of useful health care information at 1-800-850-4556 or collect outside the U.S. and Canada, 603-328-1713. If you wish to see alternatives to our student insurance programs, please consider our Individual Insurance Plans. North Park University enrollment for student, spouse and children (everybody) is done through the school. Please complete the Student Insurance Survey. By completing the survey your information will be entered into our annual drawing. Thank you for participating. Clicking will forward you to the insurance company’s website. This is not an ID Card. To request a copy of your Identification Card, please do so in the separate link shown above or you may call our office at 800-452-5772. Please contact us at 800-452-5772 for more details.